Sandy beaches, unexplored islands, scenic coastal highways and backroutes, parks and mountains, as well as quiet beach and river towns make Cambodia's South Coast an excellent area to visit for divers, snorkelers and those who like to explore by boat, bicycle or motorbike. 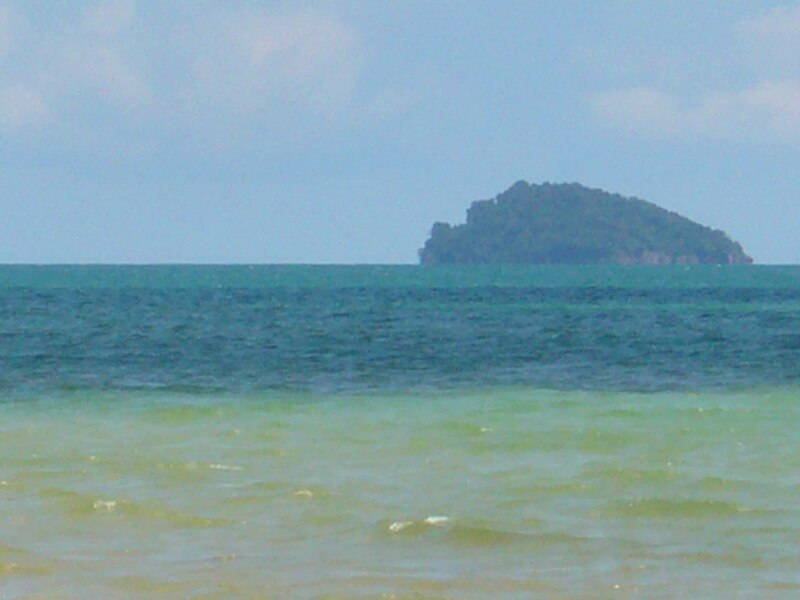 Many undeveloped islands are accessible from Sihanoukville, Kep and Ream. 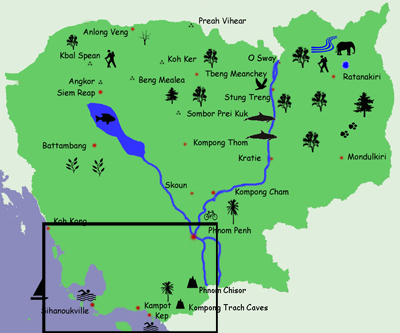 Ream is a coastal park encompassing a river, estuary, mountains, jungles, beaches, islands and coral reefs. Located only 30 minutes from Sihanoukville, the park offers snorkeling, boat trips and jungle walks with great views and wildlife as well as a chance to enjoy deserted beaches and pristine sites. Provincial capital nestled in the coastal mountains with stunning scenery, colonial architecture and whitewater rapids. A formerly-abandoned seaside resort on the edge of the jungle with beautiful mountain views of the ocean, islands and pretty beaches. A mountain-top temple offering stunning 360-degree views of the surrounding countryside and rice fields. Constructed in the 11th century, Phnom Chisor temple is older than Angkor and involves a 15-minute climb. Limestone mountains rise out of the rice fields at Kompong Trach, a small town located in Kampot Province 30 minutes from Kep. A network of caves run through the mountains, some of which contain interesting stalactite and stalagmite formations representing different animals and creatures. Besides the caves, one mountain features a temple in the caved-in center. 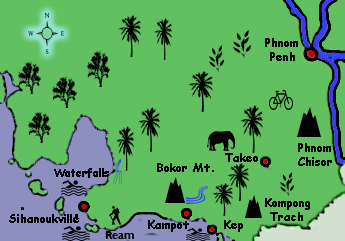 Scenic waterfalls located in the hills about 45 minutes above Sihanoukville. A great place for a swim or a picnic. A mountain and national park overlooking the coast from 1000 meters up. Bokor Mountain is also the site of a colonial-era hill station and resort that is currently being rebuilt. Lakeside town bewteen Phnom Penh and Kep. Border town on the coast near Thailand with nearby beaches and mountains. 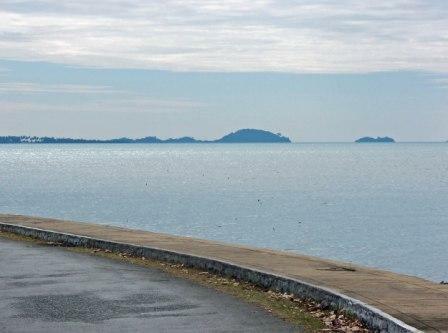 Excellent scenic cycling routes between Phnom Penh, Takeo, Kep, Kampot and Sihanoukville offer quiet roads, beautiful scenery and an excellent opportunities to explore the countryside and the coastal region of Cambodia. Relax and fish off the coast of Cambodia on board a professionally equipped charter boat. Hit the best fishing spots, snorkel secluded island bays and beaches, enjoy cold drinks and have your catch cooked up for you on board. Explore remote dive sites and a full-day or overnight liveaboard dive trip or take a PADI-certified scuba diving course in combination with a boat trip through Cambodia's islands. Combine snorkeling with a fishing tour or a boat trip to the islands as you explore Cambodia's clear waters. Boat trips through Ream National Park and to the islands off of Sihanoukville and Kep can be a rewarding way to experience the region. 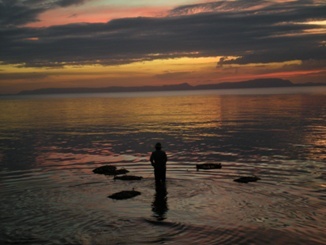 Ocean kayaking from Sihanoukville to nearby islands can be done in a day trip or overnight trip. 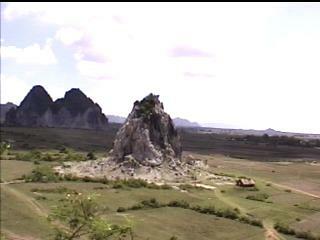 Short and long hikes can be arranged in the hills of scenic Ream National Park. Contact Us via an easy form to learn more about tours in Cambodia's South Coast Region. Copyright: Adventure-Cambodia, updated April 2013.